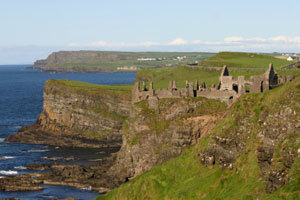 Visit Dunluce Castle for stunning views of the beautiful Antrim coast. Dunluce Castle is the most dramatically situated castle in Ireland. It sits on the edge of a hundred foot sheer cliff on the stunning coast of Northern Ireland. It is well worth the trip north to visit. The castle is in an amazing location on a piece of land jutting out into the sea. You cross a narrow footbridge to get to the partial remains of the main building. As you look at the cliff, you can imagine how part of the castle fell into the sea during a storm in the 1600s. There is an underground cave and passage below the castle ruins which leads to a pebble beach. If it's open, take the path down the cliff to the cave. The original fort at the castle site was built in the early Christian era, but the first medieval castle was probably built in the 1300s. The original courtyard of walls had a tower at each corner. A section of one wall and two towers survive. 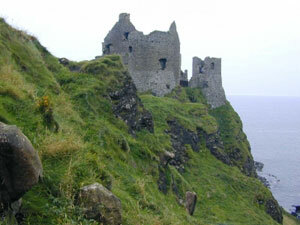 In 1513, the McQuillans were in charge of Dunluce Castle. The rest of the building remaining today is part of the fortified manor house built in the 1500s by the MacDonnells of Antrim. The MacDonnells were rulers of large estates on Scotland's west coast and were called "the Earls of Antrim and Lords of the Isles". Somhairle Buidhe (Sorley Boy) was a colorful member of the MacDonnell clan who was in charge at Dunluce Castle. Over the years, he lost the castle to Shane O'Neill and then to Sir John Perrott, the Queen's Deputy in Ireland. Sorley Boy eventually regained control. He submitted to Queen Elizabeth in 1586 and was named Constable of the Castle. A ship in the Spanish Armada sank near the castle and Sorley Boy retrieved the canons to mount on the curtain wall of Dunluce Castle. He repaired and added to the castle before he died in 1589. His sons continued the work and built a Scottish-style gatehouse which still stands. Sorley Boy's son, Randal, founded a town west of the castle and brought people from Scotland to live there. He was known as Viscount Dunluce and First Earl of Antrim. 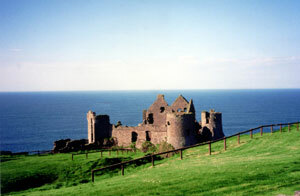 In the 1600s, Randal MacDonnell, the second Earl of Antrim, lived in the castle with his wife, Lady Catherine. Lady Catherine was one of the richest women in England before her marriage to Randal. They built a new manor house and kitchen and furnished the household with expensive furnishings and beautiful tapestries. In 1634, a storm took part of the castle into the sea and took several servants to their deaths. As a result, Lady Catherine insisted that the family build a home inland. In 1642, the Earl was arrested during the Irish Rebellion. According to some accounts, the castle contents were sent to England for safekeeping, but were distributed by the government of Cromwell. Dunluce Castle was left vacant and fell into disrepair and ruin. It was owned by the Earls of Antrim until the 1920s, when it was taken over by what is now called The Environmental and Heritage Service which maintains historic monuments and parks in Northern Ireland. There is a gate from the car park into the 17th century courtyard where you can see the partial ruins of the domestic buildings. From the courtyard, you can take the narrow footbridge over to the main building. To the west and south are the remains of the town, church and graveyard. There is a visitor center, shop and a picnic area on site. Guided tours are available. 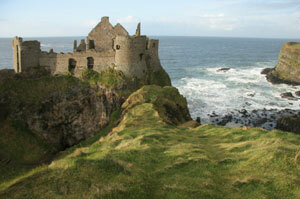 Dunluce Castle is on the Antrim coast road (A2) 3.2 km (2 miles) west of Bushmills, between Bushmills and Portrush. While you are in the vicinity of the castle, you will not want to miss the fascinating Giant's Causeway.